Happy Easter | Sprezzatura, Y'all! Seven weeks ago we set foot back on American soil. We’re in our new (old) home, settled into our new routines, seen all our family and close friends, and pretty much adjusted to life back in the U.S. We’re back in a familiar city doing familiar things, but it’s different. And it’s not just us that has changed. When you leave a place for a significant period of time, a place that you know so well, you see subtle changes in it. One thing that has struck us is that traffic seems even worse than when we left. Atlanta traffic is notorious so it’s saying something that it’s worsened in six months. We live in-town, just as we did before we left, and getting around is much more difficult. There are buildings that weren’t here when we left – huge apartment buildings, condos, mixed use developments – and more on the way. Jamming more people into the same streets, the same transportation system. No wonder traffic is worse. The wonder is that it still moves at all. After all these years of growth and sprawl, you’d think we could plan a little better. It’s not rocket science – more people in the same area equals more cars and more traffic. Probably the most jarring thing about being back is the presidential election. Being away from that for six months was wonderful. There are so many things wrong with this campaign that I can’t possibly list them all. But for me, the worse part is the lack of respect for our government. One thing that traveling has taught me is that our government is a source of pride. It’s both powerful and yielding and finds strength in compromise. It is caring and compassionate and knows that the world works better in harmony, elusive as that may be. Being a world power means being involved in the world, being aware of its problems and issues, and balancing that with domestic needs. My international experience is limited, but in Italy, most people respect the U.S. and its government. Many of the old timers remember us as their liberator and savior during WWII. A power that stepped in and formed a coalition that defeated evil. They look to America as a leader, as a land of opportunity. But this election gives no indication of any of that. What I hear coming from the mouths of too many people running for President is a lack of respect for other nationalities, and all too often a lack of respect for many Americans. And people around the globe are as afraid of what may happen as I am. So on this Easter week, I took some time to reflect back on my time in Italy. This is not an unusual thing for me to do, but it seemed especially important this week. As Easter dawned and we made our way to church (along with all the other shameful Christians), I looked around at two of my incredible grandchildren sitting next to their wonderful parents and felt a renewed sense of joy in life. I thought about our experiences of going to church in Italy, of the village life where everyone is family, of the traditions and history that bind everyone together with a common thread, and I felt a serenity and peace that often eludes me. Easter is a symbol of a new beginning, a new life, a new salvation. Before it was Easter, it still signified rebirth. Humans have known for a long, long time that this time of year is a time of hope and anticipation. It’s when things start over. 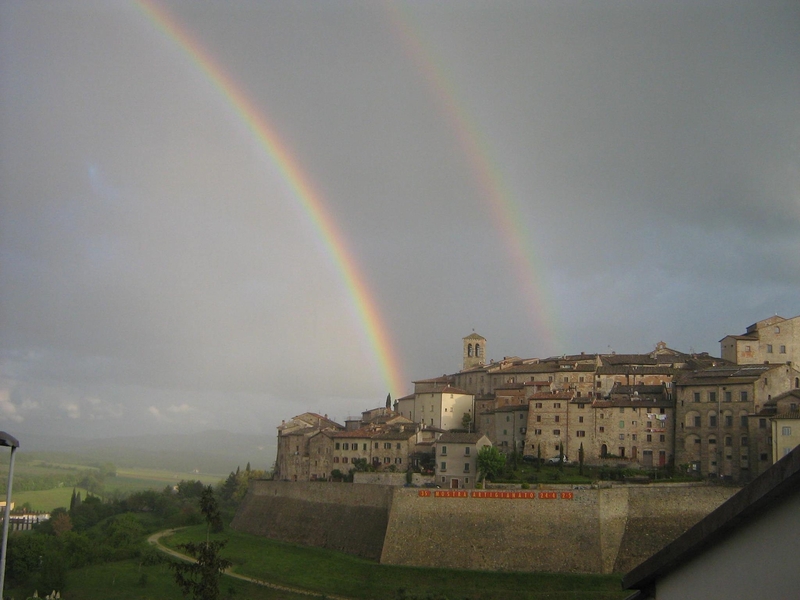 When we got home after a long day of visiting family, we had an email from our neighbor in Anghiari, Giampietro. It was a picture with a caption that translated into “The calm after the storm”. We can only hope.